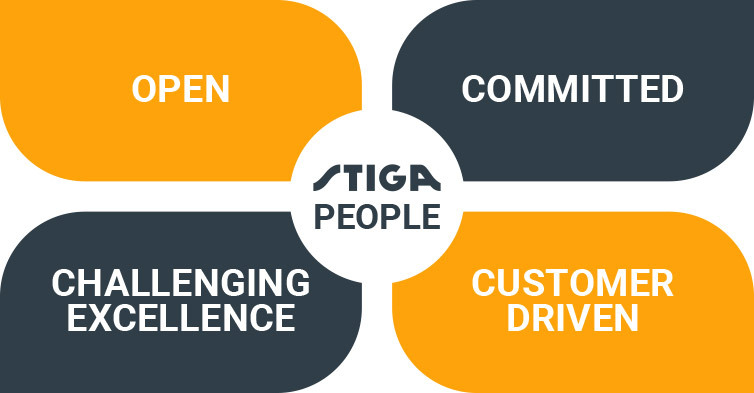 Our practical approach, takes us living our values daily through concrete behaviours that also inspire the Leadership Model adopted by STIGA. OPEN We meet customers and colleagues with a generous and open mind. We are open to new ideas, solutions and processes. COMMITTED We are dedicated, responsible and deliver on time. CHALLENGING EXCELLENCE We set high standards and challenge each other to improve and perform our best. CUSTOMER DRIVEN We listen and explore in order to improve our customer’s business. We actively listen to customers, colleagues and all stakeholders. We are respectful and always speak fairly of our customers, colleagues, our brands and goals, seeking solutions and not looking for excuses. We incorporate continuous improvement into daily business.